It's time for America to start treating homeownership as part of an equitable social contract. The American single-family home has become a globally traded commodity, with no mission other than to be sold. Inland Empire encompasses pretty much everything inland from the Southern Californian coast. A direct byproduct of sky-rocketing home prices in places like Los Angeles and Orange County, and situated in a desert, it’s thousands of square miles of what urban planners call “centerless sprawl” — a vast and loose assembly of private homes and gated communities that sit miles away from any cultural or community hubs. A place where people spend more time commuting than any other part of California. But for millions of Americans, it also represents the attainable American Dream. Sitting in direct contrast to Inland Empire, on the opposite side of the country, is Baltimore. A city founded roughly 150 years before the Inland Empire area was settled, it has become a shell of its former self. Having shed half of its manufacturing jobs since 1990, Baltimore could really be considered the Eastern-most point of the forlorn Rust Belt. It is also one of the most segregated cities in the country. This is the byproduct of decades of racially discriminatory, post-World War II housing policies that hollowed out inner-city Baltimore by funneling economic investment to the suburbs, away from the city. 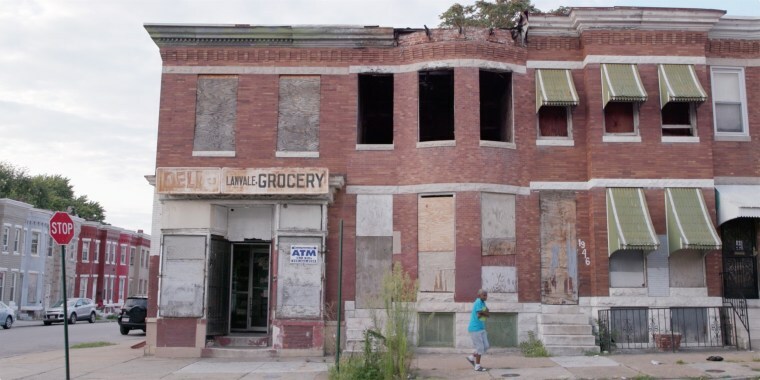 Paradoxically, the kind of housing policy that helped to create the physical perversity of Inland Empire is also responsible for the conditions of Baltimore. In fact, Inland Empire was one of the hardest hit communities of the Great Recession. And it’s continued to lag behind the rest of the country in this supposed recovery period. A recent study of distressed communities by the Economic Innovation Group found that Riverside, Calif., a city which sits at the heart of the Inland Empire, ranks at the top of the list of struggling American cities. While Inland Empire and Baltimore might seem diametrically opposed in every possible way, the housing collapse of Inland Empire in 2009 and the social unrest that reached a boiling point in Baltimore in 2015 are two sides of the same coin; two distinctly different realities in America, both reaching their predictably unfortunate ends. Sadly, no one is talking about a way to fix the problem — including the U.S. government, which had a huge part in creating it. Following World War II, and fearing a slip back into the Great Depression, the American government embarked on one of the largest social engineering projects in modern times. The project’s early goals were both functional and limited in scope: create a stable economy by giving Americans a stable housing opportunity that would allow them to store their wealth over time. Through the Federal Housing Administration, the Home Owner’s Loan Corporation, the GI Bill and many other federal and local government programs and legislation, American workers were given access to cheap 30-year mortgages, with the expectation that stable, long-term employment would enable them to pay off those mortgages. The idea was that Americans would build up equity in their homes over time, and when their mortgages were paid, they could retire on the value of their homes (or pass that value on to their children). In the process, America hoped to create a stable economy, the world’s largest middle class and thriving neighborhoods. Following World War II, and fearing a slip back into the Great Depression, the American government embarked on one of the largest social engineering projects in modern times. In many ways, this social experiment worked — but for white Americans only. Racially restrictive zoning, redlining and other racist policies meant that access to these benefits went to white families. Non-white Americans were unable to buy homes and were resigned to living in inner cities that became increasingly segregated and deprived of economic investment. Even though the Fair Housing Act, which was supposed to reverse the pernicious effects of these policies, was passed in 1968, the reverberations of this system surround us today. A 2018 study by WUNC, the Associated Press and the Center for Investigative Reporting shows that even when controlling for applicants' income, loan amount and neighborhood, African Americans and Latinos are still denied mortgages at rates twice as high as their white peers. When your home is overwhelmingly the primary asset in your life, the lasting effects of this injustice are profound. When we talk about recovery from this most recent housing collapse, we often look to the Case-Shiller Housing Index, a data set that tracks average home values across America. But value can’t always be conveyed in dollar signs, the physical space it occupies or its proximity to useful services. We must calculate its negative values as well, including the inequality that it may have helped increase. MORE FROM GIORGIO ANGELINIWatch the trailer for "Owned: A Tale of Two Americas"
Housing policy in America must reflect the fact that the American Dream has never been accessible to everyone. In this way, it is something of a lie. And we must also stop perpetuating a housing economy of booms and busts, a cycle that inevitably leaves millions of Americans at the whim of a globalized marketplace and the lasting effects of systemic disenfranchisement. If we truly want to achieve the American Dream, we need to look at homeownership as part of an equitable social contract. That means revising policies so that housing opportunity is no longer reserved for certain classes and races of people. Housing should be a right, not a privilege. And until it is, we can never begin to address the profound harm American housing policies have inflicted over the past 70 years. Giorgio Angelini is the director of "Owned: A Tale of Two Americas." He was also the executive producer for the feature film "My Friend Dahmer" (2017) and directed a documentary-short for celebrated performance artist Mary Ellen Carroll entitled "My Death is Pending…Because." To learn more about Angelini's film as well as America's obsession with real estate, listen to his conversation with Chris Hayes on a new episode of "Why Is This Happening?"